Has anyone figured out the right combination of Speedway spindles & arms to work best on the 5 lug conversion with the stock steering box? I would call them up and tell them what you want to do, to end up with an S10 spindle with an arm 1/2" shorter. Or I would try 69 Z28 arms on the new spindles. Smiley wrote: I would call them up and tell them what you want to do, to end up with an S10 spindle with an arm 1/2" shorter. Hey Smiley, are you proposing a "fix" to our diminished turning radius using stock S-10 spindles with the stock manual box and arm? Not that the stock turning radius was any good to start with, can it be improved upon? Are you suggesting modified S-10 spindles here? I am not attempting to hijack a thread here, just learn more about the mod I performed and what to expect when were done, thanks Smiley for all of your input. 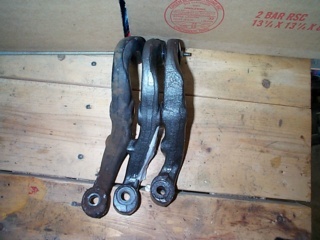 These spindles should also accept the 1st gen Camaro steering arms to prevent the reduced turn radius and slower steering response when swapping to stock S10 spindles and using the Vega steering box. 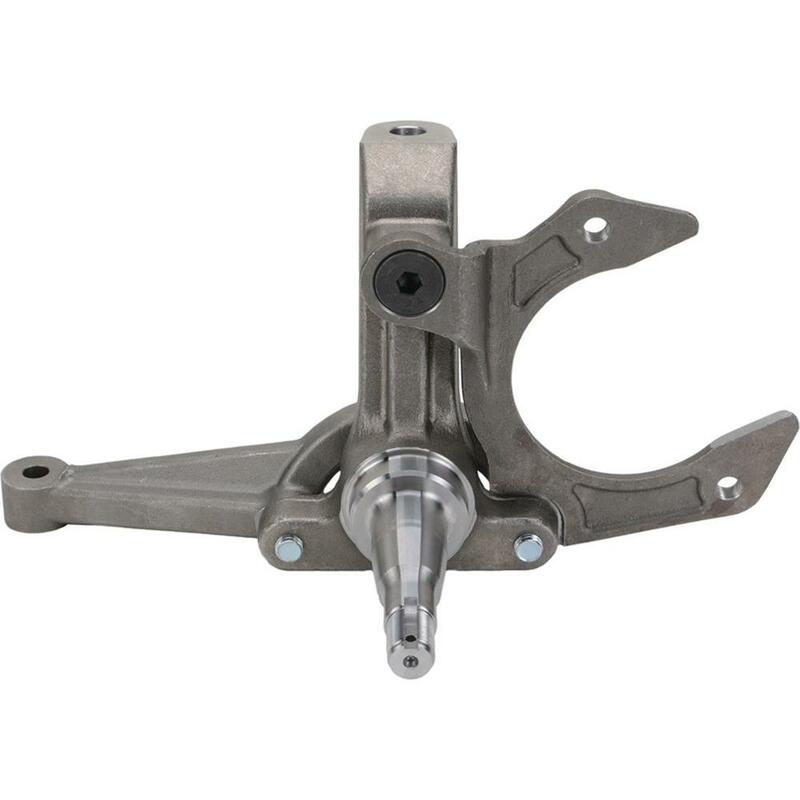 the shortest arms are 5.25", middle arms are 5.75" and the long arms are 6.20"
Speedway now makes a 3piece Metric spindle $130 each, they use S10 ball joints and geometry but with bolt on steering arms like a first gen Camaro. It looks like the 3 piece arms share the same 4.125" center to center arm bolt spacing with the 67-69 Camaro. and the longer arms for those doing the S10 brake swap wanting to maintain the H-body arm length with a stock steering box. I think some people have used G-body spindles not knowing they have even longer arms than S10 spindle arms. SHORT 5.25" LH-3954875 RH-3954876 Used on power steer, and Z/28 fast ratio manual. MEDIUM ARM 5.5" length RH-3916266 LH -3916265? not sure what ratio. 67 and into 68 manual steer. MEDIUM ARM 5.5" length RH 3954874 LH3954873 - All except for PS and 302 1969 only. Last edited by Smiley on Wed Feb 07, 2018 5:38 am, edited 3 times in total. This post is for stock steering box. I know the shortest are too short. Need 6-1/4. Three lengths to choose from makes it possible to tailor the steering response to the vehicle's usage. Shortest ones for quick steering on an Autocross car, and probably the medium ones for the street. What are the length of the OEM H-body ones(someone said 6.25"?) vs. the S-10 vs. the G-body? the 67-69 f body arms are rear steer and drop down. 64-72 a body arms are front steer. in my opinion just use the a body spindle (same spindle as 67-69 camaro) instead of the g body/s10 parts and eliminate the camber issues at the same time. The Chevelle arms should then also bolt on to the 3 piece metric arms with a 5.75" length and no drop. Last edited by Smiley on Fri Feb 09, 2018 4:37 am, edited 2 times in total. monzaaddict wrote: the 67-69 f body arms are rear steer and drop down. 64-72 a body arms are front steer. in my opinion just use the a body spindle (same spindle as 67-69 camaro) instead of the g body/s10 parts and eliminate the camber issues at the same time. i used the chevelle spindles with the camaro drop down arms,, the chevelles are straight,, but I have a rack. 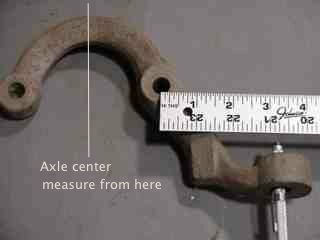 Smiley wrote: The Chevelle arms have a different ctc measurement and they are too short from the spindle to the ball joint. The A-body arms I have are 5.75" from the centre of the spindle to the centre of the tie rod hole. I am using these because they allow more wheel back spacing, especially with a drop spindle. So it looks like the trick setup will be A-body spindles and arms. That should quicken up the steering, especially with a manual box, or provide better clearance with a rack and/or wide wheels. So do they have the same taper as the S-10 spindles so we can use the available Bob Gumm ball joint spacers? spencerforhire wrote: So do they have the same taper as the S-10 spindles so we can use the available Bob Gumm ball joint spacers? No, they don't. The S10 ball joints use a 9.52 degree taper, while the Chevelle/Camaro ball joints use a 7.15 degree taper. The large taper diameters of the studs are similar, but the small taper diameters of the S10 are smaller than the Chevelle/Camaro. So we're left with modifying the control arms(not really a big deal) to accept the A-body ball joints if we want the quicker steering and the ability to choose steering arm length. It was hoping for too much to expect it to be easy. You can use the 5.75" Chevelle arms on the new Speedway 3 piece metric spindles with S10 brakes and ball joints or Monza ball joints and Bob Gumm ball joint adapters.